issue625: fix naming convention for existing namespaces. Created on 2010-01-07.18:33:11 by malte, last changed by malte. related to search algorithms that I don't think should be part of the core. to tell if it's intentional when something is not put into a namespace. Can anybody think of additional code that we'd like to put into its own namespace? If not, we can probably close this issue. The options namespace was introduced in issue626. we cannot use "using Options::Options;". Updated list of current namespaces and links to issues. We discussed to stick with two directories for heuristics and evaluators today. > task and utility classes? perhaps it's not wise to do it if we can already expect moving them again soon. for the "easy" part and one each for search, state, task and utility classes? wrong, a common directory might make more sense. code ("Don't look into directory 'lp' unless you need an LP solver"). I updated the suggestion in the summary. was never designed with "search engine" as an actual abstract interface in mind. search, not to provide a well-thought out general abstraction for search algorithms. stuff, and thinking about how various parts of the search code work together. e.g. by introducing a new class between SearchEngine and LazySearch/EagerSearch. into logical components than it does currently. at the moment are the proposed directories "heuristics", "evaluators", "options"
ready to work on them. Added cross-reference to issue61 and issue266. of the plugin dependencies there. that are too small to get their own subdirectory. example) to get their own namespace? their own CMake plugin? think I understand the underlying rationale. (Or perhaps I don't agree with it. have a "core" directory which is a mess of unrelated things. more to do with states than with search, and I'd reflect that in the name. heuristics and the LP solver. depend on it. 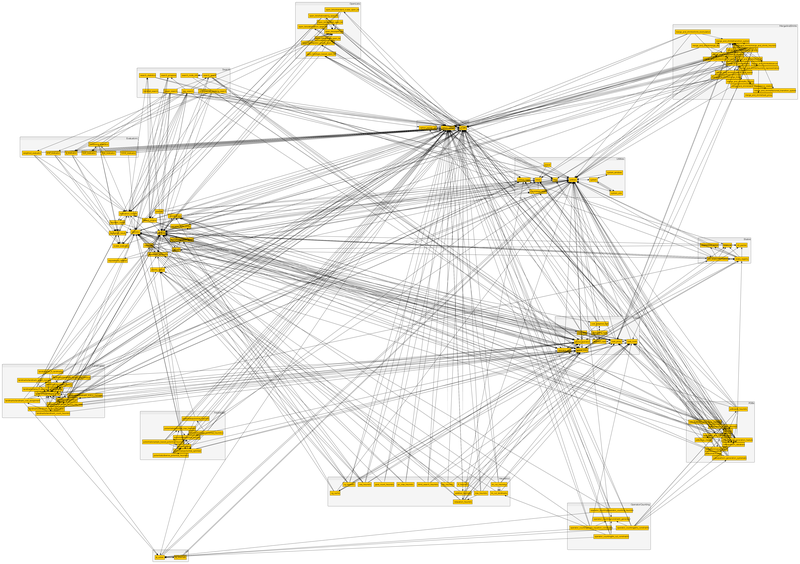 On the other hand, its a bit weird to have dependencies in the core. the summary, so we have a basis for discussion. Feel free to edit and comment. wanted individual namespaces for them. - We want to finally introduce more namespaces soon. - There will be a 1:1 mapping between namespaces and CMake plugins. heuristic) will get their own namespace, but not their own subdirectory. heuristics without their own namespace, or all open lists. then be replaced by things like LandmarkCut::Heuristic. namespaces, which currently says "(As of r3821, this has not yet been done.)". summary: Suggested file and namespace structure (still under discussion). The suggested namespace names are in parenthesis, either for individual files or for all files in one directory. A star after the name means that the plugin is only used as a dependency. ./ (Core) planner.cc axioms.cc causal_graph.cc domain_transition_graph.cc equivalence_relation.cc evaluation_context.cc evaluation_result.cc globals.cc heuristic_cache.cc heuristic.cc priority_queue.cc sampling.cc scalar_evaluator.cc search_engine.cc successor_generator.cc variable_order_finder.cc utility/ (Utility*) countdown_timer.cc rng.cc system.cc system_unix.cc system_windows.cc timer.cc tracer.cc utilities.cc utilities_hash.cc states/ (States*) int_packer.cc per_state_information.cc segmented_vector.cc state_id.cc state_registry.cc tasks/ (Tasks*) abstract_task.cc cost_adapted_task.cc delegating_task.cc global_operator.cc global_state.cc operator_cost.cc root_task.cc task_proxy.cc task_tools.cc options/ (Options*) option_parser.cc option_parser_util.cc plugin.cc open_lists/ (OpenLists*) alternation_open_list.cc bucket_open_list.cc epsilon_greedy_open_list.cc open_list.cc pareto_open_list.cc standard_scalar_open_list.cc tiebreaking_open_list.cc type_based_open_list.cc evaluators/ const_evaluator.cc (ConstEvaluator) g_evaluator.cc (GEvaluator) combining_evaluator.cc (CombiningEvaluator) max_evaluator.cc (MaxEvaluator) pref_evaluator.cc (PrefEvaluator) weighted_evaluator.cc (WeightedEvaluator) sum_evaluator.cc (SumEvaluator) search/ search_progress.cc (SearchBase*) search_statistics.cc (SearchBase*) search_node_info.cc (SearchBase*) search_space.cc (SearchBase*) eager_search.cc (EagerSearch) lazy_search.cc (LazySearch) enforced_hill_climbing_search.cc (EnforcedHillClimbingSearch) iterated_search.cc (IteratedSearch) lp/ (LP*) lp_internals.cc lp_solver.cc heuristics/ relaxation_heuristic.cc (RelaxationHeuristic*) ipc_max_heuristic.cc (IPCMaxHeuristic) additive_heuristic.cc (AdditiveHeuristic) blind_search_heuristic.cc (BlindSearchHeuristic) cea_heuristic.cc (CEAHeuristic) cg_heuristic.cc (CGHeuristic) cg_cache.cc (CGHeuristic) ff_heuristic.cc (FFHeuristic) goal_count_heuristic.cc (GoalCountHeuristic) hm_heuristic.cc (HMHeuristic) lm_cut_heuristic.cc (LMcutHeuristic) lm_cut_landmarks.cc (LMcutHeuristic) max_heuristic.cc (MaxHeuristic) merge_and_shrink/ (MergeAndShrink) distances.cc factored_transition_system.cc fts_factory.cc heuristic_representation.cc label_equivalence_relation.cc labels.cc merge_and_shrink_heuristic.cc merge_dfp.cc merge_linear.cc merge_strategy.cc shrink_bisimulation.cc shrink_bucket_based.cc shrink_fh.cc shrink_random.cc shrink_strategy.cc transition_system.cc landmarks/ (Landmarks) exploration.cc h_m_landmarks.cc lama_ff_synergy.cc landmark_cost_assignment.cc landmark_count_heuristic.cc landmark_factory.cc landmark_factory_rpg_exhaust.cc landmark_factory_rpg_sasp.cc landmark_factory_zhu_givan.cc landmark_graph.cc landmark_graph_merged.cc landmark_status_manager.cc util.cc operator_counting/ (OperatorCounting) constraint_generator.cc lm_cut_constraints.cc operator_counting_heuristic.cc pho_constraints.cc state_equation_constraints.cc pdbs/ (PDBs) canonical_pdbs_heuristic.cc dominance_pruner.cc match_tree.cc max_cliques.cc pattern_database.cc pattern_generation_edelkamp.cc pattern_generation_haslum.cc pattern_generation_systematic.cc pdb_heuristic.cc util.cc zero_one_pdbs_heuristic.cc potentials/ (Potentials) diverse_potential_heuristics.cc potential_function.cc potential_heuristic.cc potential_max_heuristic.cc potential_optimizer.cc sample_based_potential_heuristics.cc single_potential_heuristics.cc util.cc -> Suggested file and namespace structure (still under discussion). The suggested namespace names are in parenthesis, either for individual files or for all files in one directory. A star after the name means that the plugin is only used as a dependency. ./ (Core) planner.cc axioms.cc causal_graph.cc domain_transition_graph.cc equivalence_relation.cc evaluation_context.cc evaluation_result.cc globals.cc heuristic_cache.cc heuristic.cc priority_queue.cc sampling.cc scalar_evaluator.cc search_engine.cc successor_generator.cc variable_order_finder.cc utility/ (Utility*) countdown_timer.cc rng.cc system.cc system_unix.cc system_windows.cc timer.cc tracer.cc utilities.cc utilities_hash.cc states/ (States*) int_packer.cc per_state_information.cc segmented_vector.cc state_id.cc state_registry.cc tasks/ (Tasks*) abstract_task.cc cost_adapted_task.cc delegating_task.cc global_operator.cc global_state.cc operator_cost.cc root_task.cc task_proxy.cc task_tools.cc options/ (Options*) option_parser.cc option_parser_util.cc plugin.cc open_lists/ (OpenLists*) alternation_open_list.cc bucket_open_list.cc epsilon_greedy_open_list.cc open_list.cc pareto_open_list.cc standard_scalar_open_list.cc tiebreaking_open_list.cc type_based_open_list.cc evaluators/ const_evaluator.cc (ConstEvaluator) g_evaluator.cc (GEvaluator) combining_evaluator.cc (CombiningEvaluator) max_evaluator.cc (MaxEvaluator) pref_evaluator.cc (PrefEvaluator) weighted_evaluator.cc (WeightedEvaluator) sum_evaluator.cc (SumEvaluator) search/ search_progress.cc (SearchBase*) search_statistics.cc (SearchBase*) search_node_info.cc (SearchBase*) search_space.cc (SearchBase*) eager_search.cc (EagerSearch) lazy_search.cc (LazySearch) enforced_hill_climbing_search.cc (EnforcedHillClimbingSearch) iterated_search.cc (IteratedSearch) lp/ (LP*) lp_internals.cc lp_solver.cc heuristics/ relaxation_heuristic.cc (RelaxationHeuristic*) ipc_max_heuristic.cc (IPCMaxHeuristic) additive_heuristic.cc (AdditiveHeuristic) blind_search_heuristic.cc (BlindSearchHeuristic) cea_heuristic.cc (CEAHeuristic) cg_heuristic.cc (CGHeuristic) cg_cache.cc (CGHeuristic) ff_heuristic.cc (FFHeuristic) goal_count_heuristic.cc (GoalCountHeuristic) hm_heuristic.cc (HMHeuristic) lm_cut_heuristic.cc (LMcutHeuristic) lm_cut_landmarks.cc (LMcutHeuristic) max_heuristic.cc (MaxHeuristic) merge_and_shrink/ (MergeAndShrink) distances.cc factored_transition_system.cc fts_factory.cc heuristic_representation.cc label_equivalence_relation.cc labels.cc merge_and_shrink_heuristic.cc merge_dfp.cc merge_linear.cc merge_strategy.cc shrink_bisimulation.cc shrink_bucket_based.cc shrink_fh.cc shrink_random.cc shrink_strategy.cc transition_system.cc landmarks/ (Landmarks) exploration.cc h_m_landmarks.cc lama_ff_synergy.cc landmark_cost_assignment.cc landmark_count_heuristic.cc landmark_factory.cc landmark_factory_rpg_exhaust.cc landmark_factory_rpg_sasp.cc landmark_factory_zhu_givan.cc landmark_graph.cc landmark_graph_merged.cc landmark_status_manager.cc util.cc operator_counting/ (OperatorCounting) constraint_generator.cc lm_cut_constraints.cc operator_counting_heuristic.cc pho_constraints.cc state_equation_constraints.cc pdbs/ (PDBs) canonical_pdbs_heuristic.cc dominance_pruner.cc match_tree.cc max_cliques.cc pattern_database.cc pattern_generation_edelkamp.cc pattern_generation_haslum.cc pattern_generation_systematic.cc pdb_heuristic.cc util.cc zero_one_pdbs_heuristic.cc potentials/ (Potentials) diverse_potential_heuristics.cc potential_function.cc potential_heuristic.cc potential_max_heuristic.cc potential_optimizer.cc sample_based_potential_heuristics.cc single_potential_heuristics.cc util.cc After closing this issue, we should check if that also resolves issue61 and issue266.